First things first: it's been an embarrassingly long time since my last post. But, just when I was starting to get really annoyed that things like exams and studying were taking up my precious maniacal blogging time, I realized that I was done with all of that. At least for a few days. Seven semesters down, one to go. Then it's going to be maniacal blogging time whenever I want it to be! That said, you'll be happy to know that the last few weeks weren't entirely devoted to studying. We took some breaks to make some rather delicious meals, and even hosted a wee dinner gathering on Monday evening. More on that later. For now, I want to make up for my recent blogligence with a wonderfully hearty and delicious meatball stew. I've never been much of a traditional Italian meatball person, but I've recently become interested in the meatball-like foods of other Mediterranean regions. Interestingly enough, almost every culture has some version of the meatball: kibbe, kofta, albondigas....all with names significantly more appealing than "meatball." My meatball dish is Mediterranean-ish in terms of flavor, but its real roots are my mother's recipe for sweet and sour meatballs, a dish she'd make once in a while using ground turkey instead of beef. In some sense I hate to say that they were delicious, because the two main ingredients in the "sweet and sour" part of the meatballs were ginger ale and ketchup. I know, it sounds....not delicious. But trust me, it was. Unfortunately, I wouldn't be caught dead cooking with ginger ale and ketchup, so I've updated, improvised, and yuppified the recipe a bit. Ok, a lot. It's still turkey, still sweet and sour, and instead of being served over white rice, this version was accompanied by some quinoa. Brown rice or cous cous would also work very well. Also, I thought about calling this dish "Meatballs Agrodulce." Too much? I thought so, too. About the recipe: it seems long, but let's face it - every meatball recipe involves the same basic steps. I think it helps to chill the meat mixture before rolling it into balls, but proceed as time permits. I call for "cooked grain" in the meat mixture, which could be anything from pre-soaked bulgur to cooked brown rice to plain old bread crumbs. The grain helps to add some substance and soak up some of the liquid from the meat and onion. 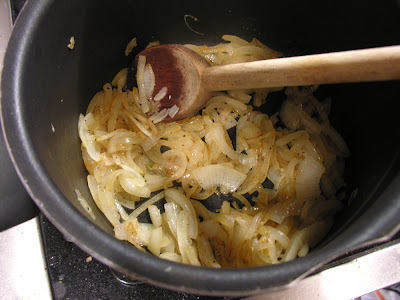 Finally, it's important to really caramelize the onions for the sauce. Doing so makes them nice and sweet, and this is sweet and sour meatball stew, after all. To get the sour, I use balsamic vinegar, which you should add according to your tastes. Oh, and did I mention that this recipe is absolutely perfect on a chilly winter night? Here's the recipe; be grateful that you can get all of the deliciousness of sweet and sour meatballs without all of that ginger ale. Soak prunes (there are more prunes in the sauce, so soak those, too) in hot water for about 30min., until plump and soft, and then chop. Mix all ingredients thoroughly - don't be afraid to use your hands! If you have time, set aside to chill for a few hours. Preheat oven to 375 degrees. Form meat mixture into 1-in. diameter balls, wetting your hands to avoid sticking. Place meatballs on a lightly greased and foiled baking sheet and bake for 15-20 min., until starting to brown and completely cooked through. Heat olive oil in a pot, and then add onions. Caramelize the onions. This should take about 15 min. of cooking. Watch the onions, stirring occasionally, to make sure that they are browning but not burning. Once they are nicely browned, add garlic, and saute for a minute or so. Season with salt, pepper, and spices. 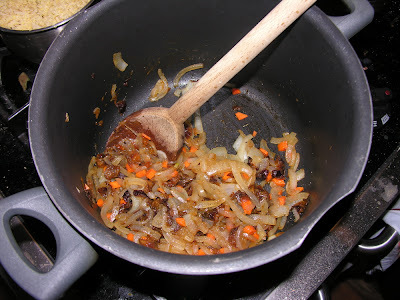 Add carrot and cook until slightly softened. Add prunes, and then add tomatoes with some juice. Season with balsamic vinegar and adjust the spices. Cook until thickened, and then add the meatballs. Cook for a few minutes more to heat the meatballs and reduce the sauce to your liking. Serve over rice, brown rice, quinoa, or cous cous. I imagine after reading this people will be clamoring for the original recipe. 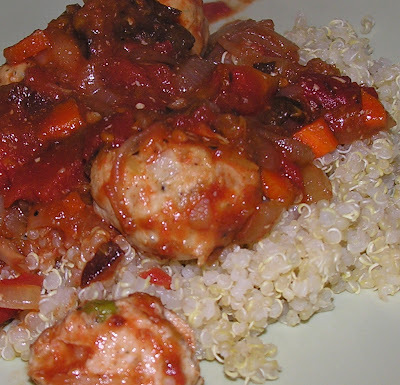 It goes something like this: make turkey meatballs using any tried and true recipe. Put meatballs in a combination of gingerale and ketchup. Proportions don't really matter that much, just put in plenty of both. Cook for a long time or until done. Eat. Your recipe really does sound good and I like the idea of using the prunes as the sweetener. 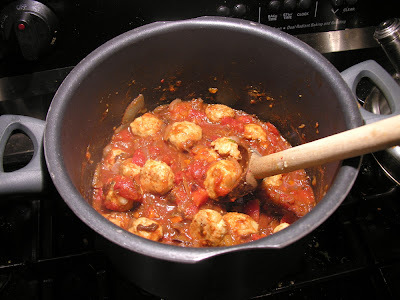 btw, sweet and sour meatballs were about the first thing I ever learned to make back when I was a lowly undergrad. I remember making them on Maple Street in Waltham. I made these last night and they were wickedly delicious! I added whole wheat couscous to the meatballs. You could just make the sauce and throw in some beans or tofu for another great meal.